Billet Aluminium Version Sportsman Wiring Board. Designed for the basic wiring solutions for the sportsman or pro street racecar. Features:6 onboard 35amp relays that trigger from you switch panel plus another 35map relay for your transbrake. Input strip and relay outputs prelabeled ignition, starter, fuel, H2O, Fan, and Lights but can be used for other purposes. Input strip has 12volt and ground out to power switch panels. Has inputs for your transbrake button, line lock button and brake light switch. Ignition box connections including: 12volt ignition power, tach signal, launch(2-step), burnout(3-step). 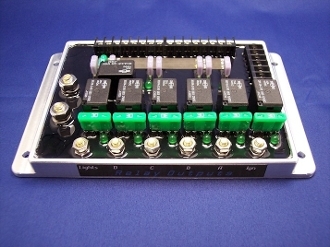 Has outputs for guage power, ground, guage lights, and tack signal. And fused outputs for transbrake, line lock, and brake lights. Relays are 35amp max so make sure the devices you connect do not pull more than 35 amps. Use an 4-8 gauge wire to connect to batter positive. Battery Neagative does not have to be a large wire unless you want to use the stud to connect other grounds to.